Garden Soil Basics Part 1| Why Test Your Garden Soil? Everyone planning or planting their garden should spend a little while investigating their garden soil-professional garden designers and landscape contractors always do (if they don’t-sack them!). The type of soil that you have will influence the structural integrity of anything constructed on it and therefore the method of construction needed. Choosing the right plants that will thrive in your garden also depends on basic knowledge of your soil type. In Part 1 of our Garden Soil Basics series we explain what soil is and why having some understanding of your local soil characteristics is important for the success of your garden design. In Part 2 (coming soon) we show you four super-easy soil tests you can carry out at home to avoid expensive mistakes. The success of both your hard and soft landscaping depend on your garden soil so save yourself some money by understanding it a little more. What is Soil and Where Does it Come From? Most of the Earth’s crust beneath our feet is made from several kilometres of solid rock, In many areas of land, the top 25 cm-1.5 metres has been transformed into soil, a mix of rock minerals and decaying plant/animal remains. Between the soil surface and the parent bedrock there are usually several layers. Soil formation begins when bedrock starts to break down into boulders, stones and gravel, then finally smaller mineral particles when it is weathered by sun, water, wind, ice, and living creatures. Garden soil is formed in layers from organic material and weathered rock. The mineral layer that forms on top mixes at the surface with organic leaf litter, animal faeces and remains and starts to attract soil bacteria, fungi and animals such as worms that decompose dead organic material. This mixed layer is topsoil, which provides the ideal environment for plants with small roots to grow. Topsoil is usually a darker colour than the soil mineral layer due to the decayed organic material. Over time the topsoil layer is exposed to more and more rain. This washes down some of the iron, aluminium and heavy clay minerals from the topsoil layer to form a new layer known as subsoil. This is usually paler and more compacted than topsoil due to less organic material and few soil organisms. Because the topsoil becomes deficient in some minerals however, strong roots of larger trees and shrubs can grow deep into the subsoil, leaving smaller, more delicate roots in the topsoil to take up water and oxygen. Soil scientists classify topsoil into many different types, usually depending on the various different weathered bedrock particles found within them. Luckily for you, here we focus on the six broad types most relevant to homeowners designing their gardens. The soil types you need to know about before designing your garden. The garden soils made from weathered bedrock result from both the type of underlying rock and the particular way that the rock was weathered in your region. CHALK soils are formed over either chalk deposits or limestone and are usually obvious from their small, stony white weathered fragments. The remaining garden soil types are usually defined by the size of the smallest weathered particles that they contain. In practice soils usually contain mixtures of different sized particles, but for our purposes you only really need to determine the dominant type. Soils that contain the largest particles feel rough and gritty to the touch and are known as SANDY soils. Rocks rich in quartz such as granite and sandstone give rise to sandy soils. SILT particles are medium sized. Under certain conditions, sand can weather into even smaller and smoother particles that feel silky and soapy to the touch. Since silt particles are easily suspended in water, they are commonly found near rivers or where rivers have been. CLAY particles are the smallest. Clay soils are the most common type. They come from the weathering of rocks with a high content of clay minerals such as granite, mudstone and also volcanic ash deposits. If you are really lucky, you will have similar quantities of sand, silt and clay and have most gardeners dream- a LOAM soil. The one type of soil not defined by its rock minerals is PEAT soil. Peat soils contains mainly organic remains of bog plants which don’t fully decay due to the acid, oxygen poor environment of boggy areas. Peat soils are dark-coloured and usually feel wet and spongy to the touch. All garden structures, including walls, patios, driveways, garden buildings and even shed bases, need the soil on which they are built to be properly stabilised. Good landscape contractors will advise removing all topsoil before you begin construction, since any soil containing degrading organic material will be loose and likely to move over time. In our article, How To Design a Patio Part 1, we explained the various layers involved in patio foundations and that they require to be made on top of compacted subsoil (contractors often call this the “sub-grade”, just to add to the confusion!). Garden paving and structures can fail on inadequately prepared soil. If the sub-grade is not properly prepared, any movement of the soil within it can cause your overlying sub-base or bedding layers to move and your paving to crack or become displaced. Garden buildings can crack if the soil heaves (lifts) or subsides (falls). You don’t want the next Leaning Tower of Pisa in your garden now, do you? Plus it is a lot less costly to identify and deal with any potential trouble spots before you build the garden than after. So what does this have to do with understanding your soil? Soils with a high sand or gravel content can easily be compacted to form a very strong base for construction. In contrast, peat soils are highly compressible and inherently-unstable due to their high moisture content. Removal of as much of the peat layer as possible is advisable, as is the provision for adequate drainage. Chalk soils don’t shrink but they can can erode easily, creating gaps in the sub-grade. Soils with high silt or particularly-expandable types of clay move and depress more with forces from above. Clay soils can also hold a lot of water making them more unstable during freeze/thaw periods. Clay soils shrink and contract substantially when the soil water content changes with the seasons (even more so if there are trees nearby), making them unstable patio/wall bases and also adding extra pressure when used behind retaining walls. If you are at all unsure of how to prepare your sub-soil for hard landscaping, it really is worth contacting a local contractor who will know the soils in your area and the best ways to deal with them. Any decent contractor will take your soil conditions into account in their quotes, or at least make provision for extra work to be costed should they discover unstable sub-soil when they begin excavations. Preparing properly will cost more, but you will have a garden that is safer and that lasts. In the same way that polar bears have thick fur adapted to cold in the Arctic and scorpions have a hard, waxy skin to cope with desert heat, plants have evolved many adaptations to their natural soil types. When placed in very different soil types, many plants struggle to thrive. We introduced this idea in Plant Shopping: How Not To Waste Your Time and Money, but explain in more detail here. One of the main reasons for plants failing is being planted in the wrong soil conditions. Plants generally grow only in topsoil since this is the only soil layer that contains everything they need to survive. The lime (calcium carbonate) in Chalky soils creates an alkaline pH (>8). This creates an iron deficiency in topsoils. Chalk-adapted plants modify their roots to cope with this but acid-loving plants such as Skimmia, Rhododendron and Blueberries cannot. Therefore they get chlorosis, making the leaves turn light green or yellow. Sandy and chalky soils do not hold onto nutrients for very long and plants adapted to these tend to have more roots than shoots. Planting fast-growing flowering perennials or roses used to a more mineral-rich clay soil in sandy garden soils will result in slower growth and even death of your plants. Most of our nutrients come from the plants and animals that we eat. For plants, their nutrients come from either decayed leaf litter or from the remains of soil organisms. In the same way that spinach gives us different nutrients from steak or bananas, the type of nutrients that plants are exposed to in their natural environments depends on the various plants that grow there. Therefore plants adapted to clay soils will be used to very different nutrients than those found in peaty areas. Similarly the types of bacteria, fungus and insects found in peat soils generate different nutrients to those in silty soils. Clay soils hold high levels of nutrients, but if they become waterlogged, the soil organisms cannot break down leaf litter into nutrients very easily. In general, many plant types can adapt well to loamy soil with a pH around neutral (i.e. pH 6-8; neutral pH is 7). However, plants adapted to more extreme soil conditions are unlikely to survive for long. Some gardens have had the natural topsoil removed and replaced by loam, especially in newer buildings. Unfortunately though, it is usually only a very shallow depth at the surface that is replaced and so plants roots can often be exposed to the original soil. It is always best to dig a hole to around a spade’s depth or more when checking out your soil. The gaps (or pores) between soil particles hold air and water next to roots. Pore spaces can also be formed due to the movement of roots, worms, and insects. In general, sandy soils have the largest pores and clay soils the smallest. Although it seems counter-intuitive, water drains from soils with large pores most rapidly, leaving plants desiccated in dry, warm weather. Plants adapted to sandy soils often have root nodules to help them extract more water from the soil. They also tend to have deep or wide root systems. Plants used to clay or peaty soils struggle in these conditions, even when there is reasonable rainfall. On the other hand, plants from sandy or chalky areas cannot take up enough air (carbon dioxide to be more precise!) from wet soils. “Right Plant, Right Place” is a great mantra to remember when planning your garden beds and borders- all garden designers and gardeners are taught this! We have some great tips on how to find out the right plants for your soil type in Plant Shopping For Newbie Gardeners | How Not To Waste Your Time and Money. 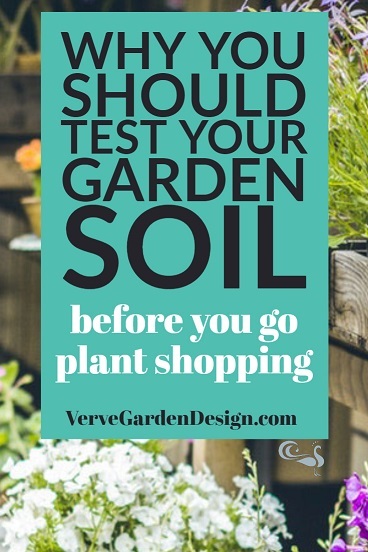 Hopefully the examples here have given you an insight into why checking out your soil before you start to plant your garden is a really smart idea. If you want to know how to test your soil, look out for Part 2 of our Garden Soil Basics series in a few weeks. Better still, subscribe to our newsletter to get an email reminder. Don't miss part 2- subscribe to our newsletter now!